As posted by Jeff on his blog, Borges may be moved before José de San Martín… we’ll have to wait & see. A majority party representative, backed by the SADE (Sociedad Argentina de Escritores), will present a bill to repatriate the remains of Jorge Luis Borges which lie in Geneva since his death in 1986, following other notable Argentines like San Martín, Sarmiento, Rosas & Alberdi. The intention of the Peronists, of whom Borges said were neither good nor bad but incorrigible, is to finalize the transfer in August during festivities to celebrate his 110th birthday. “He is an Argentine icon,” posed one of his biographers. But his widow, María Kodama, could oppose the project. Although certainly impossible, if he knew Jorge Luis Borges might comment: “Didn’t I tell you? Peronistas are neither good nor bad; they are incorrigible.” Old political adversaries of the great writer want to repatriate his remains, which have been in the Plainpalais local cemetery in Geneva for almost 23 years, to the family vault in Recoleta Cemetery. By doing so, Borges will follow the path of other noted Argentines who died abroad & whose remains were returned to Argentina, such as José de San Martín, Domingo Faustino Sarmiento, Juan Manuel de Rosas & Juan Bautista Alberdi. The intention of the majority party is to finalize the transfer in August for what would have been his 110th birthday. The initiative comes from the pro-Kirchner Congressional representative for Buenos Aires, María Beatriz Lenz, who plans to present the bill at the end of February or the beginning of March with the backing of the Argentine Writers’ Society (SADE). Its President, Alejandro Vaccaro, is one of the most recognized biographers of the writer. “Borges is an Argentine icon. Regardless if we are the kind of readers he desired or not; he already has a place in our heart. The repatriation of Borges’ remains is something that we owe ourselves & him as well,” explains Vaccaro in his Recoleta apartment which has been converted into a mini-museum dedicated to the writer. For her part, Representative Lenz assures that the bill calling for repatriation of Borges’ remains already has the support of head of the House of Representatives Alberto Balestrin, the lower house’s Vice-President Patricia Vaca Narvaja, & the head of the Kirchner faction Agustín Rossi. Borges & Peronism were always at odds; the writer never hid his fierce anti-Peronism & his lack of confidence in democracy (not about the nation) but wisely kept the topic to public declarations: “Politics will never interfere with my literary work,” he once said & experts agree with that, except for the short story “The Monster’s Party” written with Adolfo Bioy Casares & published in 1955 during a seminar in Uruguay. In an Argentina deeply divided between Peronist supporters & opposers, Borges had his reasons: a few days after the first Presidency of Juan Perón began in 1946, he was “promoted” from his position in a public library to Chicken & Egg Inspector for local markets. Two years later his mother & sister, along with others, were detained by police in Florida Street for protesting against Perón & his wife, Eva. A judge later sentenced them with one month in prision. Now, when that Argentina no longer exists, the Peronists—those “incorrigible people” as he defined them—want to bring him from Geneva where he died on June 14, 1986. 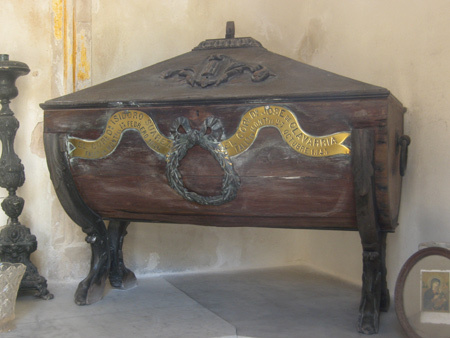 According to the large amount of documentation collected by Vaccaro, Borges often voiced his desire to be laid to rest in the family vault. The proponents of the repatriation of Borges’ remains have searched for all kinds of evidence because they foresee opposition from María Kodama, the second wife of the writer. “All Argentines agree about this; only María Kodama could be against it. Why? For one, it is difficult to understand her point of view. For another, if Borges comes to Argentina, she would lose him since he would go to the vault of Borges’ nephews & nieces,” sustained Vaccaro who has maintained well-publicized disputes with Kodama. At one time Kodama, who could not be located for this article, managed to block in Swiss court a request for the transfer of the writer’s remains to Argentina by his nephew, Miguel de Torre. Original article in Spanish located here. 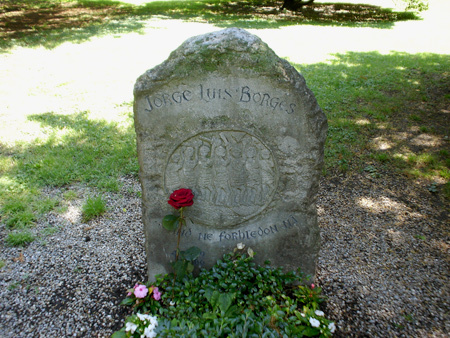 The tombstone of Borges was photographed by Gonzalo Rosendo. All Argentines, as mentioned in the article, are probably not in agreement about the return of Borges, but it is odd that he isn’t in Recoleta Cemetery. I’m a free man. I’ve decided to stay in Geneva because (my time there) corresponds to the happiest years of my life… My Buenos Aires continues to be that of the guitars, of the milongas, of the cisterns, of the patios. None of that exists anymore. It’s a big city like so many others. In Geneva I feel strangely happy. That has nothing to do with the reverence for my ancestors and with my essential love for my homeland. I find it strange that no one understands and respects the decision of a man who has taken—like a certain character of (H.G.) Wells—the decision to be an invisible man. With the iniciative withdrawn & Lenz no longer a member of Congress after elections in June 2009, Borges safely rests in peace in Switzerland.